CLARIA® Functional Clean-Label Starches empower manufacturers to meet increased consumer demand for cleaner labels enabling formulations with similar functionality to a modified food starch. CLARIA® Functional Clean-Label Starches labels simply as starch yet perform similarly to modified starches. Tate & Lyle’s line of CLARIA® Functional Clean-Label Starches empowers manufacturers to meet increased consumer demand for cleaner labels enabling formulations with similar functionality to a modified food starch. Globally, consumers are demanding convenient, great tasting foods that have recognisable ingredients on the label. In fact, one-in-four new products today is launched with “cleaner-label” claims. All CLARIA® Functional Clean-label Starch products are certified as non-GMO. CLARIA® Functional Clean-Label Starches use CLARIA® technology, a proprietary technology that has been shown to provide improved sensory attributes (neutral colour) vs. other functional clean-label starches. Coupled with Tate & Lyle’s commitment to partnership and ingredient innovation, CLARIA® Functional Clean-Label Starches provide manufacturers the opportunity to co-create the next generation of cleaner-label products. CLARIA® Bliss are functional clean label tapioca-based starches that deliver a whiter colour and a cleaner flavour than other functional clean-label tapioca starches. CLARIA® Bliss thickens and sets to form a soft, translucent gel that is especially desirable for manufacturers with the added benefits of a soft gel texture, non-GMO and gluten free attributes. CLARIA® Bliss labels as ‘tapioca starch’ enabling clean label claims on a variety of applications including dairy desserts, clear sauces, chilled ready meals or filling of fresh baked goods. The CLARIA® Functional Clean-Label Starch product line delivers on both taste and performance; these products perform well over a range of processes, offer clean taste, are white in colour, and label simply as starch. They are certified as non-GMO. These starches enable food manufacturers to meet consumer demands for simpler labels. This product line includes thickening and gelling starches; all of the products in the line offer good mouth clearing properties in soups, sauces, dressings, fillings, and dairy products when optimally used. Our CLARIA® Instant Starch range are non-GMO, functional clean label starches that build viscosity without cooking. These starches offer a clean taste and neutral colour profile. CLARIA® Instant Starch shows process tolerance that is suitable for various temperatures, acidity, shear and harsh processing conditions. CLARIA® Instant Starch is ideal for applications such as salad dressings, instant gravies and soups, and pastry fillings and creams. 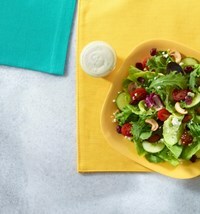 CLARIA® Instant Starch provides immediate viscosity in high-solids systems, such as fruit fillings, and can be used to build viscosity in cold-processed applications such as salad dressings. These starches display similar sensory attributes to traditional modified food starch and offer excellent bake stability. CLARIA® Functional Clean Label Starch has a clean taste and colour, making it versatile across a range of applications. CLARIA® can help manufacturers deliver clean label claims in fillings for baked goods and puddings. CLARIA® Functional Clean Label Starch can be used to launch creamy, clean tasting and label-friendly products without compromising on quality. CLARIA® Functional Clean Label Starches improve viscosity, glossiness and stability, key attributes for soups and sauces products. In applications, CLARIA® Bliss thickens and sets to form a soft, translucent gel that is gluten free and non-GMO, ideal for use in a variety of soups, cooking sauces and dressings. Is Mindfulness shaping consumer attitudes towards food? CLARIA® Functional Clean Label Starch can be applied in products that require the use of an ingredient with a similar functionality to modified food starch. Our range of products can be used across a wide range of food-product categories and processing conditions. CLARIA® Functional Clean-Label Starches use CLARIA® technology, a proprietary technology that has been shown to provide improved sensory attributes (neutral colour) vs. other functional clean-label starches. Coupled with Tate & Lyle’s commitment to partnership and ingredient innovation, CLARIA® Functional Clean-Label Starches provide manufacturers the opportunity to co-create the next generation of cleaner-label products. CLARIA® Bliss 560 Functional Clean-Label Starch has been developed for use in applications that require mildly challenging processing such as consumer at-home preparations, foodservice items, in-store prepared products or ready meals. This tapioca starch can deliver a thickened or gelled texture, with good mouth clearing properties, depending upon use level and processing. The modest process tolerance of CLARIA® Bliss 560 Functional Clean-Label Starch makes it best suited for mildly challenging processing treatments such as those used in food systems with neutral pH and high temperature processing or low pH with mild heat treatment processing, such as at-home preparations, foodservice items, in-store prepared products, or ready meals. CLARIA® Bliss 560 Clean-Label Functional Starch can typically be used at up to 4-5% in preparations such as dry soup mixes, or applications that have short shelf-life requirements. CLARIA® Bliss 570 Functional Clean-Label Starch has been developed for use in applications that require stability to moderately harsh processing conditions such as neutral to moderate acidity and moderate processing, including high shear mixers, retort, high temperature/short time (HTST) or long cook times. This tapioca starch can deliver a thickened or gelled texture, with good mouth clearing properties, depending upon use level and processing. The process tolerance of CLARIA® Bliss 570 Functional Clean-Label Starch makes it best suited for use in applications that require moderate process tolerance. Examples include systems with mild acidity, such as acid sauces or dressings which require moderate processing conditions, including high shear mixers, retort, and high temperature/short time (HTST) or longer heat times. CLARIA® Bliss 570 Functional Clean-Label Starch can be used at up to 4-5% in applications that have short shelf-life requirements such as food service items or in-store prepared products. CLARIA® Bliss 580 Functional Clean-Label Starch has been developed to have excellent process tolerance for use in products such as yogurt that undergo ultra-high temperature treatment (UHT), high-temperature short-time treatments (HTST) and/or high pressure homogenisation. This product may deliver a thickened or set texture, depending upon use level and processing. This tapioca starch can deliver a thickened or gelled texture, with good mouth clearing properties, depending upon use level and processing. The high process tolerance of CLARIA® Bliss 580 Functional Clean-Label Starch makes it best suited for extremely challenging processing treatments such as ultra-high temperature processed (UHT) of crème desserts and/or high pressure homogenisation of yoghurt. Typical use level for CLARIA® Bliss 580 Functional Clean-Label Starch in the white mass of yogurt is 1- 2%. The acid resistance of CLARIA® Bliss 580 Functional Clean-Label Starch also makes it suitable for use in other acidic, heat processed food products. CLARIA® Elite Functional Clean-Label Starch has been developed to have excellent process tolerance for use in products such as yogurt that undergo ultra-high temperature treatment (UHT), high-temperature short-time treatments (HTST) and/or high pressure homogenisation. When optimally cooked, this product delivers a thickened texture with good mouth clearing properties. The high process tolerance of CLARIA® Elite Functional Clean-Label Starch makes it best suited for extremely challenging processing treatments such as ultra-high temperature processed (UHT) of crème desserts and/or high pressure homogenisation of yoghurt. Typical use level for CLARIA® Elite Functional Clean-Label Starch in the white mass of yogurt is 1- 2%. CLARIA® Essential Functional Clean-Label Starch has been developed for use in applications that require mildly challenging processing such as consumer at-home preparations, foodservice items, in-store prepared products or ready meals. When optimally cooked, this product delivers a thickened texture with good mouth clearing properties. The modest process tolerance of CLARIA® Essential Functional Clean-Label Starch makes it best suited for mildly challenging processing treatments such as those used in food systems with neutral pH and high temperature processing or low pH with mild heat treatment processing, including at-home preparations, foodservice items, in-store prepared products, or ready meals. CLARIA® Essential Clean-Label Functional Starch can typically be used at up to 4-5% in preparations such as dry soup mixes, or applications that have short shelf-life requirements. CLARIA® Plus Functional Clean-Label Starch has been developed for use in applications that require stability to moderately harsh processing conditions such as neutral to moderate acidity and moderate processing, including high shear mixers, retort, high temperature/short time (HTST) or long cook times. When optimally cooked, this product delivers a thickened texture with good mouth clearing properties. The process tolerance of CLARIA® Plus Functional Clean-Label Starch makes it best suited for use in applications that require moderate process tolerance. Examples include systems with mild acidity, such as acid sauces or dressings which require moderate processing conditions, including high shear mixers, retort, and high temperature/short time (HTST) or longer heat times. CLARIA® Plus Elite Functional Clean-Label Starch can be used at up to 4-5% in applications that have short shelf-life requirements. CLARIA® TOP-GEL starch is an instant maize starch that differs significantly from other instant starches commonly used in “instant mix” food products. This unique starch hydrates in water at ambient temperatures, forming a thick, smooth consistency and then setting to a gel. 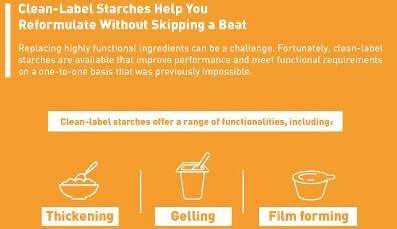 Other instant starches thicken in water without heat, but none duplicate the gel forming functionality of this starch. Among the outstanding characteristics of CLARIA® TOP-GEL starch is its ability to thicken and set to a gel quickly using room temperature water. The gel strength of the starch exceeds that of other instant maize starches. Gels made with this starch, unlike most gelling agents, will resist flow when exposed to high heat. They are heat stable, retaining form and firmness, even when held at oven temperatures. This starch can be used conventionally as an “instant” starch in applications to form gels at room temperature. It can be used in high moisture desserts to allow removal from moulds within short time frames. In cold batters, it suspends fruit pieces, nuts and fillings before and during baking. Cookie doughs exhibit improves machinability during processing and the starch controls spread and symmetry during baking. For bakery fillings, the starch provides a resistance to flow and reduces boil out during baking. In low moisture confections, this starch provides extrusion consistency and delivers gelled texture without high temperature cooking. It can also be used in low moisture ready-to-serve icings; it reacts with fructose sweeteners to form the finished set in the frosting. It is also suitable for microwave preparations where it can be used at reduced levels as a thickener to suspend flavours, colours, spices and other dry ingredients.